Coconut oil. Tallow. Lard. Pastured butter. Ghee. Duck fat. 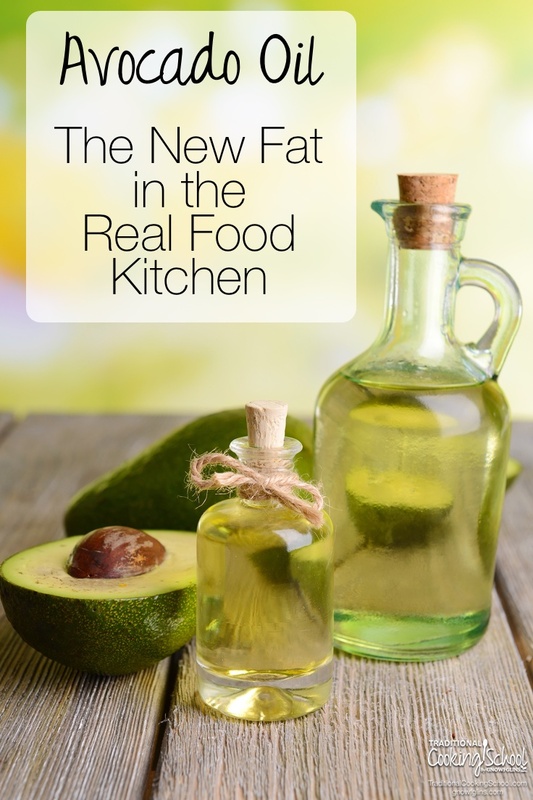 These are the Traditional fats we typically hear so much about. They are delicious, and they reliably give us moist baked goods, crisp fried foods, flaky pie crusts, buttery toast, and have even taken our coffee to the next level. Their benefits are numerous, and we choose them, hands-down, over rancid vegetable oils such as soybean, canola, corn, sunflower, grapeseed, and peanut oils. We know those fats are no good, right? Just in case you've been hanging out under a rock, you need to have ditched your bottle of yellow vegetable oil as of yesterday, and here's why. Until recently, the only vegetable oil in our home was organic extra virgin olive oil. I took special care to buy from a family farm every year, making certain that my olive oil wasn't cut with another, cheaper vegetable oil. Make sure your source for olive oil — and all other foods — is a trusty one (source). It's high in beneficial monounsaturated fats. Avocado oil's fatty acid breakdown goes like this: 70% monounsaturated fat, 12% omega-6 polyunsaturated fat, 1% omega-3 polyunsaturated fat, and 12% saturated fat (source). Monounsaturated fat (MFA), or oleic acid, is found primarily in beef, olive oil, avocados, lard and certain nuts like macadamias. Like saturated fats, MFA form the core structural fats of the body and are non-toxic even at high doses. Interestingly, monounsaturated fats seem to be the only fats that typically fat-phobic groups like the AHA and fat-friendly groups like Atkins and other low-carbers can agree are completely healthy (source). According to both conventionally supported and alternative research, MFAs have been shown to reduce the risk of heart attacks and stroke, reduce harmful LDL cholesterol, and may aid in weight loss. These fats are also anti-inflammatory, and may ease inflammatory conditions such as arthritis, rheumatoid arthritis, and skin conditions like eczema. Most vegetable oils are composed primarily of polyunsaturated fat (PUFAs). Exposure to high temperatures (and even light!) will change the molecular structure of vegetable oil, causing it to go rancid. It's highly likely that a bottle of vegetable oil is rancid before it ever goes in the shopping cart. Rancid vegetable oils are a big contributor to inflammation in the body because they contribute to free radical damage in our organs and tissues (source). Avocado oil, however, is made of monounsaturated fatty acids, which are able to withstand high temperatures without any changes to their molecular structure (source). Cold-pressed avocado oil can be used safely in temperatures up to 490 degrees Fahrenheit, although I wouldn't recommend using any vegetable oil, even avocado oil, at temperatures this high. Animal fats like tallow are much more suited to high-heat frying, and the taste can't be beat! If you're in a pinch, though, go for the avocado oil over canola, corn, soybean, or cottonseed oil for frying any day. I've come enjoy a bit of coconutty flavor in the foods I cook with my virgin coconut oil, but I remember there was a taste adjustment at first. Avocado has such a mild flavor that it won't take any effort for your taste buds to love it. Sauté with it, bake with it, roast veggies with it, make salad dressing or mayo with it, and enjoy this almost flavorless oil. Please tell me I'm not the only one who admits to laziness when it comes to softening butter and/or melting coconut oil before adding to recipes. First-world problems, am I right? 😉 Avocado oil is already liquified, making it super convenient to use without having to melt first. It may keep us beautiful. Avocado oil can protect against free radical damage, cellular degeneration, and inflammation. Research has shown that, whether consumed or used topically, this oil can increase collagen in connective tissue, which is very beneficial for fragile or aging skin (source). Avocado oil is one of the most penetrative of all natural plant oils. Unlike most moisturizers and many other natural oils, it is believed to penetrate through the epidermis and into the dermis layer of our skin. This results in extremely soft and hydrated facial skin. And, due to its humectant properties that prevent drying out, this moisturizing effect is long-lasting (source). Since I'm prone to using many of our pantry staples on my face and body — I wash my face with raw honey and shave my legs with coconut oil — avocado oil is another item I may be testing out on my skin. It can be used on eczema and psoriasis, diaper rashes, and burns to relieve pain, itching, and redness. Try it instead of conditioner if you have a dry, itchy scalp. Bonus: use it as a carrier oil for your essential oils! Look for oil sold in dark, not clear, bottles. This minimizes any risk for oxidation. I've only found avocado oil in a dark green bottle. Don't buy raw or unprocessed avocado oil. This type of avocado oil should not be heated, although it is expensive and difficult to find. Look for cold-pressed or unrefined, cold press process avocado oil. Avoid any oil that is processed with chemicals, caustic sodas, or solvents. Avoid any avocado oil that is very bright green, which indicates that coloring was added to the oil. The thick skin of avocados makes their insides impermeable to pesticides, which is why it is fine to buy non-organic avocados. You can also rest easy and buy non-organic avocado oil. I've been using the Chosen Foods brand found at Costco or here. Do you use avocado oil? Would you like to try it? THANK YOU!! I’ve been using this exact brand from Costco and hoping it was a good oil to use. I email Weston A. Price just a few weeks ago as there is no research on their site. They told me it was good for a salad oil, but this info is much more helpful. I thought maybe their claim of high heat cooking was too good to be true. Thanks for the post!! Good to know! I discovered avocado oil when I bought some natural avocado oil potato chips. They were quite nice. I look forward to using it in mayonnaise. I’m going to see if I can find some and give it a try. What brand are the chips? I’d love to find some with a good oil!! I have been using this as well, especially since I became concerned with olive oil and higher heat. I switched to avocado oil and now use it almost exclusively in cooking. Now I think I will add it to my nightly oil mixture for my face too! I have been using avocado oil for over a year. I buy it through Vitacost, it comes in a tin can and it’s wonderful! My favorite way to use it is with balsamic vinegar as a simple dressing. Thank you for this informative post! I have been wanting to learn more about avocado oil and this really helps. I bought my first bottle this summer, organic, cold pressed, and in a dark, glass bottle, but I was less than impressed with it. I thought the taste was strong and it had a very slightly acidic or fermented fragrance. Also the label says to use within 3 months of opening. In your experience does avocado oil have a strong or funny smell and do you strive to use it up especially quickly? That recommendation was particularly confusing to me since most good fats are shelf stable for so long. Thanks for your thoughts! That sounds very strange. My avocado oil does not have a fragrance at all. I guess it’s always possible that you came across a bad or old bottle. I don’t strive to use my avocado oil quickly, and I’d say that one bottle lasts me an average of two months. If stored away from light and heat in a dark bottle, the oil should last a very long time. The bottle I bought a few weeks ago has a 2016 expiration date, if that tells you anything. I hope you’ll try again! That was my first and only experience with avocado oil as well. It had a strong and bitter flavor. I ended up throwing out the mayo I made with it. I’m guessing that we just happened to get rancid bottles. I’m going to try it again, it sounds wonderful! I completely believe in the wonderful healing properties of avocado oil. My son had eczema on his face due to severe food allergies and once we started using this oil his face cleared up almost immediately. Great stuff! It makes a great mayo-I use raw honey in it as well and we LOVE IT. I use the same brand you do and get it @ BJ’s. I just made some hand/body lotion out of avocado oil, looking for it to nourish my dry skin! That’s wonderful, Carol! You’ll have to let us know how you like it! We use this oil but sparingly due to the high Omega 6 to Omega 3 ratio. Please tell me why you recommend “grapeseed oil” in one of your mayo recipes (with the Avocado oil)? – it is not a good oil. Somebody I know has a hand oil press and talking about pumpkin and sunflower oil they might try making? Is that healthier or is it not a healthy fat? Thanks so much!